Note: Klianti House is not included in the combined ticket and the guided tour of up to 5 sites. 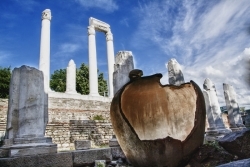 - PLOVDIV NIGHT OF MUSEUMS AND GALLERIES. * Note: The venue is not closed to the public during a photo session. VIP Dressing room - Pamporova house - 2 Tsar Ivaylo Str. Adress: Plovdiv, 31a Knyaginya Maria Luisa bul.